Not quite sure why, but I was really looking forward to bee blocks this month. And with the *Picture-Perfect* Polaroid Block Swap nearing a close (Read: almost time for Deb to sort more-blocks-than-she-ever-could-have-imagined), well it seemed like a good idea to get them stitched up and mailed off! 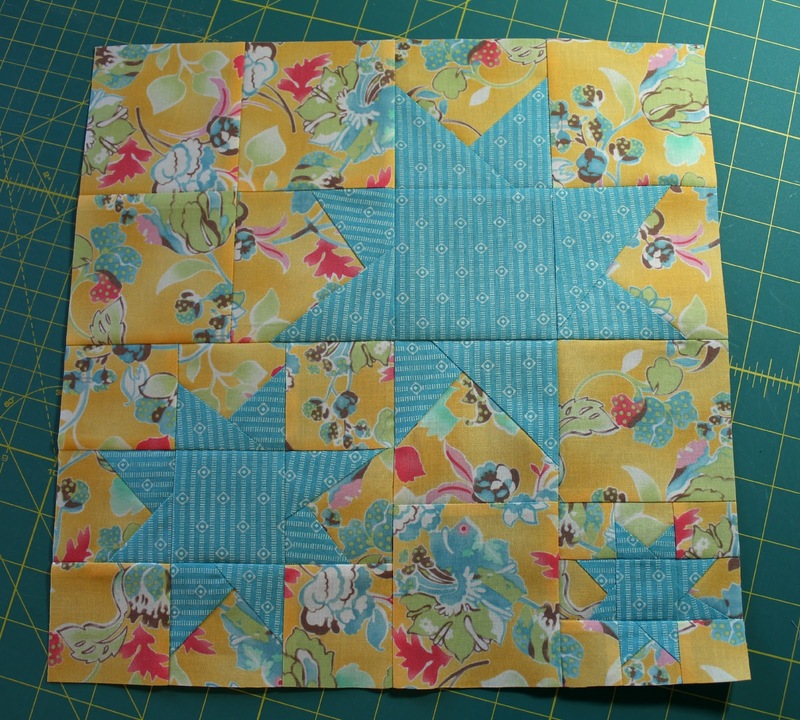 First on the list was Marci's Stargazer block for the Modern Blocks Bee. The pattern is by Angela Pingel from Modern Blocks and has seen alot of popularity. Though it looks complicated, it really is not, and I thoroughly enjoyed putting it together. All of Marci's Stargazer blocks will have these blue stars, surrounded by a variety of prints. I'm anxious to see this one put together! 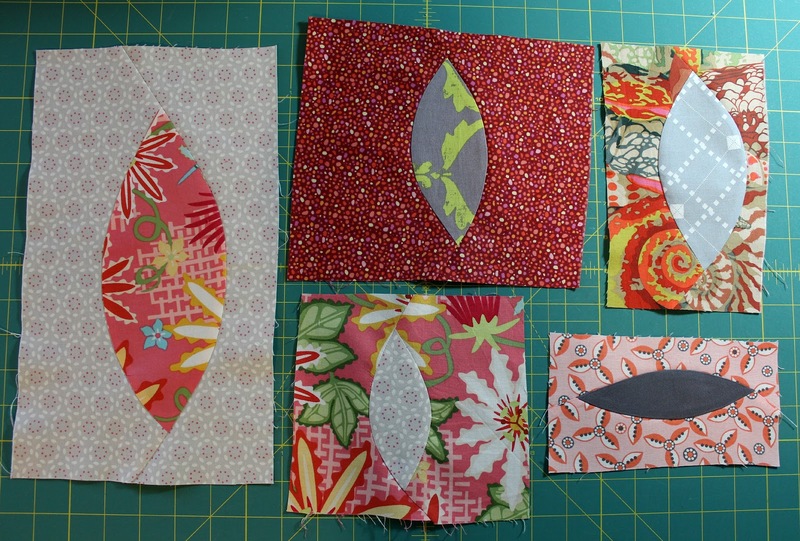 I picked what I considered the hardest blocks next - some Improvisational Curves in the form of Pods, technique found in Quilting Modern. Unfortunately, I'd neglected to try these in the workshop I took with Katie a few weeks ago, so was a tad apprehensive about them! I didn't see that the book included one tip that Katie shared that I found very helpful when sewing curves. As you stitch each curve (step 8 on p. 158), hold the pod (underneath) with your right hand, and the background fabric (on top) with your left. Then as you sew, keep bringing the edges together. Kind of hard to explain, but that technique really helped me. These blocks are for Spontaneous Threads, and she sent such an interesting array of fabrics! We were invited to include some from our stash, so I incorporated a couple of my grays. Finally, it was time for the Patchwork Chevron blocks for the FAITH circle of do.Good Stitches. 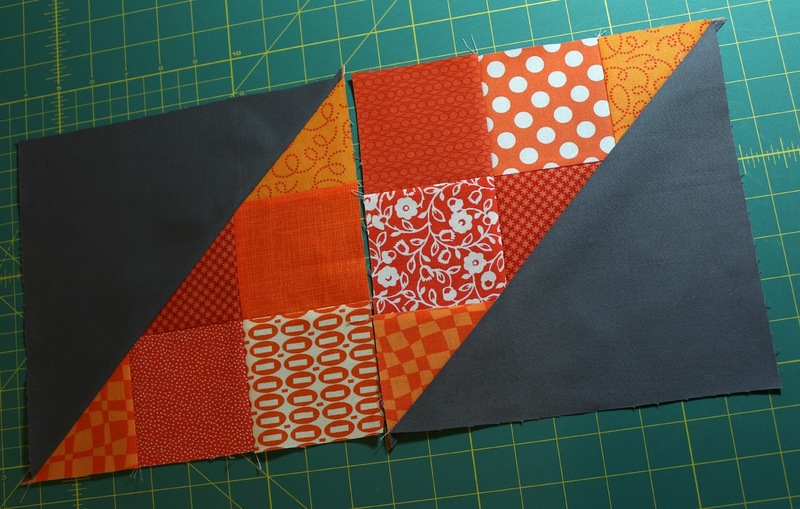 We used the block tutorial by Jeni of In Color Order, but with 3 1/2" print squares and a 9 1/2" solid square. I'm really liking these, and the idea for placement that Des has is terrific! So it feels good knowing these all are going out in today's mail and I can move on down the to-do list! You have been busy again! Love the orange blocks! Very striking! Thats an awful lots of block making - I love how the improv pods turned out. They look great. The pods look interesting - I really need to take a good read through that book. Good luck with sorting all the polaroid blocks! I need to check today's mail for both of those fabric packs. I love the blocks, especially those pods. I also love your patchwork chevron blocks, the orange and gray look great together! Thanks for sharing! My block looks amazing and is constructed so beautifully! I need to get on those pods, but I'm scared, though I am sure after I'm done, I think "why was I scared?" Hehe!